What you really want to know is how does it taste? Incredible! Oh my gosh – these chili lentils are amazing. They have a “meaty” texture to them and the seasonings were perfect. I made them to take to a friend’s house for a taco bar and everyone loved them. Even the meat lovers! The leftovers heat up well and have even more flavor than the first day. This recipe is going into our regular rotation as a quick and easy meal. Not only is it tasty, meatless, economical and quick, but it’s also low calorie. What’s not to love? Bring 5 cups of water and lentils to a boil in a covered 12 inch skillet. 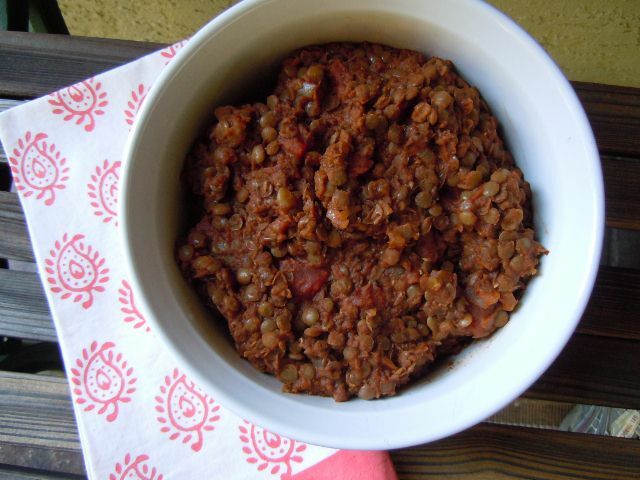 Reduce heat to medium and cook until the water is almost absorbed and the lentils are just tender about 12 minutes. (Note: I used green lentils and they took 20-25 minutes to cook.) Turn off heat. Meanwhile, heat the 2 tablespoons of water or broth in a large dutch oven over medium heat. Add the onion and cook until tender, about 5 minutes. Add garlic, chili powder, cumin, and cook until fragrant, about 30 seconds. Add the cooked lentils and canned tomatoes. Reduce heat to medium low and cook until most of the liquid has evaporated, about 5 minutes. Adjust the seasoning, including a generous sprinkling freshly ground black pepper. Heh heh, I know ALL about cooking way too many llnites. =) I usually make a little over a cup (with tomatoes, veggies, stock, etc.) and it feeds my husband and me all week long. I swear those things multiply in the pot like nobody’s business. But I never seem to get tired of them, so I guess that’s not a bad thing. How much oregano do you add? I see it mentioned in the instructions, but not the ingredients list. Thanks. I don’t use oregano in this recipe – thanks for catching the mistake! I corrected it. You could add a 1/2 teaspoon though and it would be good! Can this be cooked in the Instant Pot? If so: time and settings please? I have not cooked this in the instant pot so I don’t know how long it would take. What if I don’t have a dutch oven? You can make them in a skillet no problem. I’m making these right now and it looks nothing like the picture! Also I cooked the lentils (first-timer here) as instructed but they’re still a little hard. Is that normal? There’s a lot of liquid…should I have drained the tomatoes? The recipe doesn’t say to. There was also still quite a bit of water in the lentils after cooking and I didn’t drain it (recipe doesn’t say I need to). Coming from using hamburger and a taco seasoning packet for tacos this definitely isn’t what I think of when I think “taco”. Did I do something wrong? ?